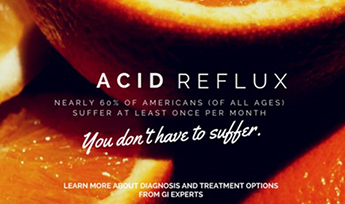 If you regularly suffer from heartburn or acid reflux, don’t dismiss it. It could be a symptom of GERD, which can lead to serious conditions, including Barrett’s esophagus and esophageal cancer, if left untreated. What are GER and GERD? GER stands for gastroesophageal reflux, which occurs when stomach acid flows into your esophagus (the tube joining your mouth to your stomach). This can cause symptoms including coughing after meals or at night, belching, heartburn (a burning pain in your chest), acid regurgitation, and upset stomach. If your GER symptoms occur more than once a week, you may be diagnosed with GERD (gastroesophageal reflux disease). Symptoms may disrupt your sleep, which can affect how you feel and function during the day. GERD can affect anyone and is often caused by a dysfunctional LES (lower esophageal sphincter). Lose weight. Excess weight increases pressure on your stomach and can cause the lower esophageal sphincter (LES) to relax. Change your diet. Use an elimination diet to find your triggers. Culprits are acidic foods like citrus fruits and tomatoes, and LES irritants like black pepper, peppermint, and coffee. Avoid foods high in fat, sugar, and salt, and swap caffeinated, carbonated or acidic drinks (e.g. alcohol and citrus juices) for water. Eat small, eat slow. Eat smaller meals, take smaller bites, and chew them thoroughly. Large meals can trigger symptoms, particularly if you eat too fast. Stop eating before you feel completely full. Stay upright after eating. Gravity will help if you have GERD, encouraging food to travel downwards and discouraging stomach acid from moving upwards, so help it out by avoiding reclining or lying down for 3-4 hours after eating. Stop smoking. Smoking damages membranes that protect the esophagus, increases acid secretion, reduces lower esophageal muscle function, and reduces saliva production vital to acid neutralization. Always see a gastroenterologist if your symptoms occur at least once a week or they are severe. If left untreated, GERD can lead to serious conditions, including Barrett’s esophagus and esophageal cancer. A gastroenterologist will assess your esophagus using diagnostic procedures such as an upper endoscopy. They will also ask about your family history, personal medical history, lifestyle, and diet to determine the cause of your symptoms. At Digestive Health Reno, every physician is fellowship-trained in gastroenterology and supported by expert medical staff. Patient experience is a top priority, but great healthcare doesn’t come at a premium—procedures cost a fraction of hospital-based procedures. Digestive Health Reno offers convenient drop-off and pick-up, enhanced safety accreditations, and more privacy. Go online to learn more about Digestive Health Reno or schedule an appointment, or call (775) 600-4717. The expert team can answer all your questions and schedule your appointment.